I've updated my original list of 25 kitchen gadget recommendations. I often get requests from readers for gift recommendations before big gift-giving occasions. So, here are some favorite less common kitchen items that I use in my kitchen. 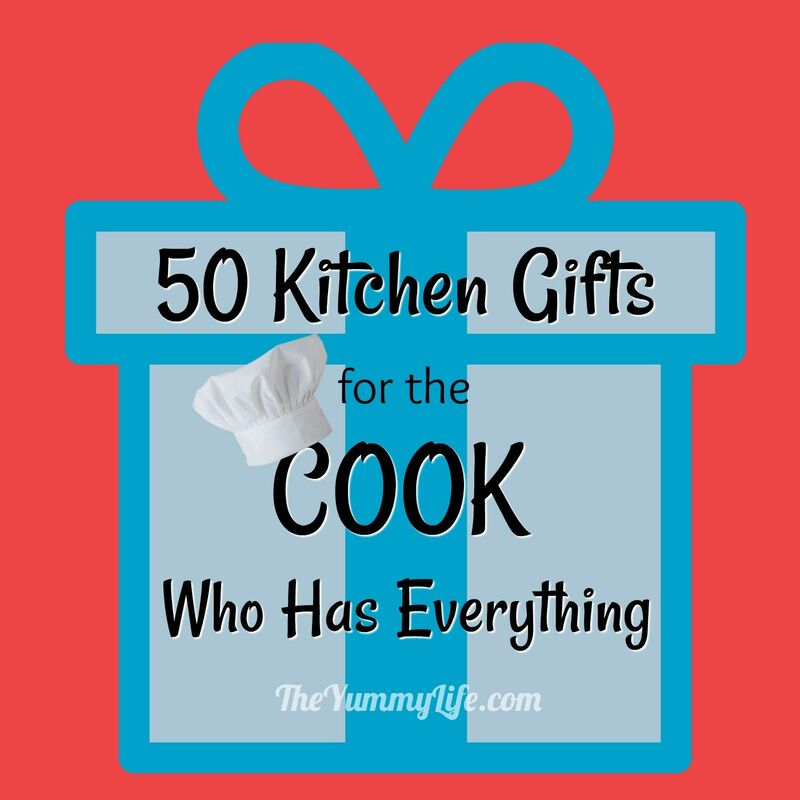 Hopefully, that will mean that there is something on my list that the cooks on your gift list aren't as likely to have. Or, maybe you'll see something you'd like to add to your own wish list. Some of these items I use more often than others, but all of these come highly recommended for the different tasks they perform. Sometimes I enjoy a particular kitchen gadget because it saves me time or makes a task simpler, and sometimes it simply has a cool, fun factor for me when I use it. This collection includes products that achieve both--fun and efficiency. So, here are 50 of my favorite not-so-ordinary kitchen gadgets. Many of these are recommended by Cook Illustrated's America Test Kitchen--that's my go-to source any time I'm buying something new for my kitchen. You'll find many of these items in cooking and department stores. All but one are available on Amazon; I provide links so you can check them out if you like. 1. Adjustable Rolling Pin (view on Amazon). After using a traditional rolling pin for many years, I gave this a try 3 years ago and I've never looked back. The changeable rings on the end guarantee perfectly evenly rolled pie crusts and cookie dough. It's some clever engineering. I love this thing. (There is also a deluxe metal version--it is dishwasher shape and can be chilled to prevent sticking, but it's more expensive.) See how I use this in my post, Sour Cream Sugar Cookies. 2. 4-Tier Folding Cooling Rack (view on Amazon). This is such a space saver! Instead of spreading cookie sheets and cooling racks out all over your counters, you can stack four of them on this handy rack. It folds flat for easy storage. I slip mine in my cabinet right next to my baking sheets. 3. Decorating Pen (view on Amazon). This simple, clever tool is easy to fill with frosting, fruit sauce, or melted chocolate. Simply squeeze while writing or squiggling like a pen. It has 3 different tips and is dishwasher safe for easy clean up. 4. 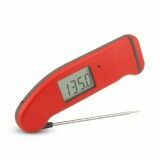 Thermapen Instant Read Thermometer (view at Thermoworks).This amazing thermometer gives an accurate temperature reading in 3 seconds. If you watch any of the celebrity cooks on TV, you'll notice them using this handy tool. I always use mine when I'm cooking meat, because it's the only way to know when it's cooked enough to be safe, but not too much to dry it out. It's the cream of the crop and is pricey, but oh so worth it. It comes in lots of fun colors. It's a top pick by Cooks Illustrated's Test Kitchen. 5. 24 hour, Professional 4-Item Timer (view on Amazon). I purchased this after reading about it's high performance in Cooks Illustrated testing. You can time 4 different items at one time from 1 minute to 24 hours. Sounds like it would be complicated to use, but it is so easy! When I have several things cooking at one time, this timer is indispensable. 6. Food Scale with Pull-Out Display (view on Amazon). This is an essential tool when precise measurements are needed in recipes. 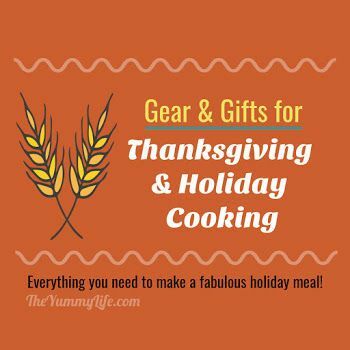 I use it the most for weighing baking ingredients (like flour) and when I prepare jars of food for canning, to insure recipe success & canning safety. This model has a pull-out display--a nifty feature that makes it easy to read the weight even when a big bowl is shadowing it. It's a top pick by Cooks Illustrated's Test Kitchen. 7. Froth Maker (view on Amazon). This is by far the easiest way to froth milk for lattes and hot chocolate. Add hot milk to it, pump it a few times, and voila! You can also add cold milk to the glass cylinder and heat it in the microwave before pumping, so you only use one container (that's what I do). I think it's better than the steamed/frothed milk from an espresso machine. And, clean up is a breeze--simply put it in the dishwasher. 8. French Press Cold Brew Coffee Maker (view on Amazon). This makes a great gift for anyone who likes iced coffee or the smoothness of cold brewed coffee with no bitterness. For tips on making cold brew coffee, see my post on Cold Brew Iced Coffee. 9. Whipped Cream Maker and Dispenser (view on Amazon). You can have real whipped cream in an instant, any time with this easy gadget. Simply fill it with heavy cream, add whatever sweeteners or flavoring you like, and it dispenses delicious whipped cream. No whisking, whipping, or mixing. The cream keeps in this container in the fridge for up to 10 days. 10. Muffin Top Pan (view on Amazon). This is a way to have every muffin bite have the taste and texture of the top of a muffin. I like it for better portion control, too. It also works well for baked pancakes and mini pizzas. I use mine the most for baking 6 eggs at a time that are the perfect size for breakfast sandwiches. See how I use it in my post, Make-Ahead, Healthy Egg McMuffins. 11. Pancake, Donut, Cupcake, and Muffin Batter Pen (view on Amazon). This makes dispensing batter tidy, easy, and precise. Both ends screw off for easy cleaning. Dishwasher safe, too. See how I use it in my post, Maple Pumpkin Spice Baked Donuts. 12. Donut Pan (view on Amazon). Baked donuts are so much healthier and easier than the fried ones. This is a fun pan with endless donut flavor possibilities. Check out my recipe for Maple Pumpkin Spice Baked Donuts. 13. Innovative Pie Weight (view on Amazon). This came highly recommended by Cooks Illustrated's Test Kitchen, so I gave it a try. It is such an improvement over the traditional little pie weight balls use to make pre-baked pie crusts. Simply set it inside the prepared pie crust and it forms to fit it. The heavy bottom keeps the crust flat as it bakes. Easy to use and dishwasher safe. Recommended by Cooks Illustrated Test Kitchen. 14. Pie Crust Shield (view on Amazon). I used to always have burnt pie crusts until I started using these shields that rest on top of the crust rim. I used an aluminum version of this, but this new and improved silicone version is much more durable and dishwasher safe. 15. Multi-Cherry Pitter (view on Amazon). This quickly pits 4 cherries in one motion, for prepping cherries for pies, fruit salads, and jam making. Recommended by Cooks Illustrated Test Kitchen. 16. Citrus Juicer/Squeezer (view on Amazon). This is one of my favorite gadgets. You can get every drop from a citrus half in one squeeze. I almost always grab this rather than pulling out a big juicer. It can be used for juicing small oranges, lemons, and limes. I used it for juicing lemons in my post about Applesauce Blends. 17. Herb Scissors (view on Amazon). These are very convenient for quickly and easily preparing small amounts of chopped herbs. The multiple blades cut several little pieces in one snip. They are dishwasher safe for easy cleaning. 18. Herb Keeper (view on Amazon). This works amazingly well at keeping herbs fresh in the fridge for up to 3 weeks. Dishwasher safe, too. This model got a top rating from Cooks Illustrated's Test Kitchen. 19. Butter Bell (view on Amazon). This magically keeps butter fresh for up to 30 days without refrigeration. That means you can always have soft, spreadable butter that's ready to use. This always sits on my counter; I've been using it for years. 20. Baggy Rack (view on Amazon). These clever gizmos are like having an extra pair of hands. They hold bags open for easy, no-spill filling. The arms extend to accommodate different bag sizes. I use if frequently for filling bags for the freezer, as you can see in my Golden Coconut Brown Rice post. It's also handy when filling bags of my 6 Instant Meals-On-The-Go. 21. Rub-Away Bar (view on Amazon). Cooks Illustrated's Test Kitchen recommended this bar, so I gave it a try. It really works! Rub it on your hands under running water to remove odors like garlic, onions, and fish. 22. Baked Tortilla Bowl Molds (view on Amazon). I use these for baking oil-free tortilla bowls for taco salads. See how I use them in my posts, How to Make Tortilla Bowls and A Tortilla Bowl Taco Bar. These make such a fun meal--my family loves them! They're great for taco party buffets, too. 23. Fish (and everything!) Spatula & Turner (view on Amazon). I bought this for flipping delicate fish, but have ended up using it for lots of other cooking. It works great any time I need to flip something delicate that I'm sauteing and can also be used as a whisk. It's my favorite spatula. 24. Pull-Apart Roasting Rack (view on Amazon). If you've ever struggled with removing a cooked turkey from it's roasting rack, then you'll love this. It has a removable rod that holds it together in the center while the turkey (or other meat) rests on it and cooks. Transfer the cooked turkey to a platter, remove the rod, and the two sides of the rack pull apart, up, and away. Clever and so helpful! 25. Silicone Round Lids & Food Covers (view on Amazon). These versatile lids can be used in the microwave, fridge, or oven. They create a tight seal, so you can greatly reduce your use of plastic wrap and aluminum foil. No need to dirty more containers for leftovers, just add one of these lids to the bowl and put it in the fridge. This set of 4 lids will fit bowls or stove-top pots that range from 6" to 11.75" in diameter. 26. Silicone Large Rectangular Lid & Food Cover (view on Amazon). This has all of the same versatility of the round covers above, but it is sized to fit over a 9x13 pan. No need to cover your casserole with foil and plastic wrap, this lid is all you need for a tight seal; and it can go in the microwave, oven, or fridge. 27. Silicone Square Lid & Food Cover (view on Amazon). Just like the rectangular version above, but this one fits square pans and casseroles dishes. I have all of these covers in #25-27 above--round, rectangular & square--and my use of foil and plastic wrap has decreased dramatically. I love their convenience and versatility and Mother Earth is smiling. They all have a lip with a hole, so they can be conveniently hung on a hook inside your cabinets. I use these daily. 28. Staybowlizer (view on Amazon). These will hold your mixing bowl steady as you work. They are made of silicone and form a tight seal around bowls that are used for double boiling on the stove top, making the bowls very stable and easy to stir. Recommended by Cooks Illustrated Test Kitchen. 29. Economical Silicone Mat Set (view on Amazon). These are non-stick, washable and reusable, and can be used in place of parchment paper. The corners of these 3 mats are rounded to fit perfectly in half and quarter sheet pans--better than Silpat mats at a fraction of the cost. 30. Jumbo Spatula (view on Amazon). This spatula is big enough to easily transfer round cake layers and multiple cookies at one time. I use mine the most for removing toast and pizza from my toaster oven. In fact, I store mine on top of my toaster oven so it's is handy for frequent use. 31. Adjustable Shaker (view on Amazon). The top of this versatile shaker has 3 different sizes of holes; just turn to adjust for the size you want. I have one filled with flour that is perfect for lightly dusting my work surface when rolling cookies, pizza dough, and pie crust. It's also great for Parmesan cheese and seasoning salts. There's also a stainless steel version with a handle. 32. Oxo Sugar Dispenser (view on Amazon). This is perfect for keeping sugar close at hand for coffee, cereal, or pouring into measuring spoons for baking. The side spout makes it easy to control pouring. 33. Soap Dispenser (view on Amazon). This acrylic dispenser has an extra long spout so you don't have to move it to easily pump soap directly into the sink or onto brushes or sponges. Mine rests permanently by my kitchen sink. I like the sleek, simple design, which makes it blend in with any kitchen decor. 34. Cut-Protection Glove (view on Amazon). Have you ever cut your nails or fingertips when using a zester, grater, or peeler? This comfortable, breathable glove helps to protect against those kitchen cuts. The glove is machine washable and very "handy" to have in your kitchen. 35. Kitchen Mount Stand for iPads and Tablets (view on Amazon). This is incredibly helpful for those of us who frequently access recipes on our tablets as we cook. It's very easy to mount on walls or under cabinets and has quick release buttons making it easy to remove the tablet. The stand is highly adjustable and pivots and rotates to many positions. I love being able to have my tablet recipes at eye-level as I cook. 36. Magnetic knife and tool bar (view on Amazon). You can mount these strips under your cabinets, on walls, or on the ends of upper cabinets to keep knives and tools at your fingertips. I have limited cabinet space in my kitchen, so I have these strips installed to help me store and organize a variety of knives and tools like tongs, a microplane, pizza cutter, and kitchen shears. I love having my frequently used tools in easy reach. 37. Paderno Spiralizer (view on Amazon). These are all the rage for making quick work of turning veggies into fancy spirals, like healthy zoodles (noodles made out of zucchini). This model is the #1 recommendation of Cooks Illustrated's Test Kitchen. It has 3 blades and is super easy to use. 38. Silicone Piggy Steamer Cover (view on Amazon). This makes a perfect cover for a bowl or plate in the microwave. It has small holes to vent steam, and it stays cool to the touch. It tolerates heat and can also be used to cover pans on the stove top. Recommended by Cooks Illustrated Test Kitchen. 39. Thermal French Press Pot (view on Amazon). This is great for both home use and travel. For fans of French press coffee, you may be accustomed to needing to drink your coffee fast before the traditional glass pot quickly cools down. This pot has thermal properties that keep the coffee hot for up to 2 hours. We take one of these along when we travel. Most hotel rooms have a way to heat water; we take along coffee and this pot, and have everything we need to make great coffee. 40. Silicone Oil Dispenser and Brush (view on Amazon). I reach for this when I want to lightly coat a pan with oil. It's so much more reliable than oil misters that have a tendency to clog. It's also great for basting. There's a brush on one end, and another end for pouring drops and drizzles. Keep it by your stove and it won't be long before you don't know how to cook without it. 41. Round Cutter Set (view on Amazon). This set of 12 round cutters is made of durable stainless steel. Use these for cutting pastry, cookies, and biscuits, and dough for ravioli and Chinese dumplings. This set has every circle size you'll ever need. Recommended by Cooks Illustrated Test Kitchen. 42. Danish Dough Hook (view on Amazon). If you're a bread baker, you want one of these! This simple whisk may look a little odd, but it makes it a breeze to mix dough. It's particularly great for mixing a batch of no-knead bread dough. I was skeptical before I tried it, but am amazed how quickly this combines the dough ingredients. Read the 5 star Amazon reviews, if you're not convinced. 43. Roll Up Dish Drainer (view on Amazon). I bought this on a whim uncertain of how useful it would be. Boy, am I glad I did! I keep in on my sink all the time. It's easy to roll it off to the side when I need my entire sink, and is so convenient for rolling over all or part of my sink for quick draining of washed fruit & veggies and air drying the dishes I hand wash. It's also heat tolerant, so it can double as a large trivet. 45. Mini Slow Cooker (view on Amazon). This handy little 1.5 qt. slow cooker is the perfect size for cooking small batches and keeping dips, sauces, and syrups warm. It is full-featured for the affordable price with a removeable, dishwasher safe stoneware insert and 3 settings: high, low, and warm. You can see mine in use as a warmer in my post Microwave Ballpark Cheese Sauce. 46. In-Drawer Bamboo Knife Block (view on Amazon). This is my favorite way to store sharp knives. It fits into a drawer where they are out-of-sight yet convenient to access. I prefer this to having a knife block taking up valuable counter space in my small kitchen. 47. Stainless Steel Cooling and Roasting Wire Rack (view on Amazon). The grid pattern on this ensures that cookies won't fall through when they're cooling. Because it fits perfectly in a half-sheet (13 x 18") baking pan, it can also be used as a roasting rack. I have several of these--the only kind of cooling/roasting rack I use. 48. Stand for Ladles, Lids and More! (view on Amazon). This is a major multi-tasker! Use it to hold ladels and lids upright and contain all of the drips. It doubles as a cookbook or ipad/tablet stand, too, and it has a very small footprint on your counter. 49. Collapsible Silicone Microwave Popcorn Maker (view on Amazon). When you want to make a quick batch of popcorn, this delivers! You can make the popcorn with or without oil or butter. It's dishwasher safe and collapses for easy storage. 50. Microwave Pasta Cooker--It really works! (view on Amazon). Honestly, I would have never tried this thing until I saw it highly recommended by Cook's Illustrated. It's jaw-dropping amazing how great the pasta turns out in this. No more boiling big pots of water! You can make up to 4 servings of all shapes and sizes of pasta per batch. There's never a boil over, you don't have to stop and stir, and it cooks evenly without sticking. It's seriously like magic. I love using it at home, but it would also be great for college dorm dwellers. 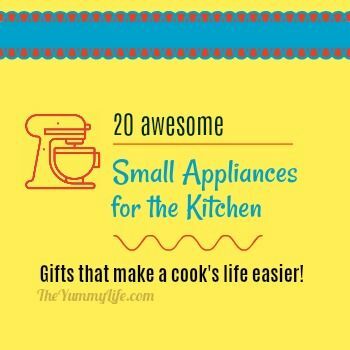 Those are 50 of my favorite uncommon kitchen gadgets. 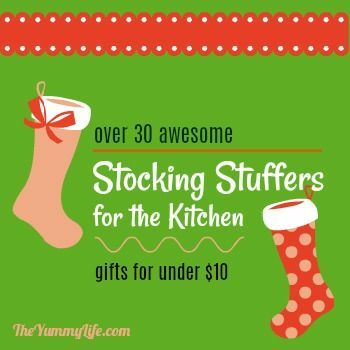 Please feel free to make other kitchen gift suggestions in the comments section. I love hearing from you.